Every now and then we come across a story, photo or video online that just makes our day. This is one of them. Posted yesterday on Huffington Post Arts & Culture section, the video by Jarbas Agnelli is testament to the beauty that’s possible when our own creative intuition—imagination, inspiration, whichever word speaks to you—conspires with that of nature itself to create a work of wonder. The original photo of the birds on electric wires, taken by Paulo Pinto, was published in 2009 in the Brazilian Newspaper, "O Estado de São Paulo." "Reading the newspaper one morning, I saw this picture of birds on the electric wires…I cut out the photo and decided to make a song, using the exact location of the birds as notes. I was just curious to hear what melody the birds were creating…I just erased the birds for effect at the end, but didn't change their positions at all. What would be the point?" Agnelli isn’t the first musician to be inspired by nature, and we certainly hope he won’t be the last. Beethoven’s 5th Symphony, so it is said, was famously inspired by the ortolan bunting (E. hortulana). Both Agnelli and Beethoven stand in the company of countless painters, sculptors, writers, playwrights, designers, philosophers, theologians, scientists, and engineers of all stripes and disciplines, who saw something in nature (we use the term “to see” in the esoteric sense: felt, heard, sensed, et al). What did they see? Beauty. Truth. Answers to their deepest questions and fulfillment of their most profound longings. This tradition continues, from art to biomimicry, but for how long? As the Swiss TV video reports, the little bird that inspired one of the greatest pieces of music written, is at risk of extinction in Switzerland, though efforts are being made to preserve and revitalize its habitat. What’s more, this humanity all too often sees not with the intuitive “third eye” of the heart, but rather the cold, heartless rational eyes of the head: missing the deeper Truths nature has to teach us in favour of superficial observations that support our highly intellectual, subjective and egoistic worldviews. Case in point: a most troubling blog posted on HuffPost Green by Carl Pope, “Takers and Makers in the Rain Forest.” Despite being the former Executive Director and Chairman of Sierra Club, Pope examines the relationship between Ficus, the so-called “strangler figs,” and other types of trees in the rainforest in capitalist terminology. 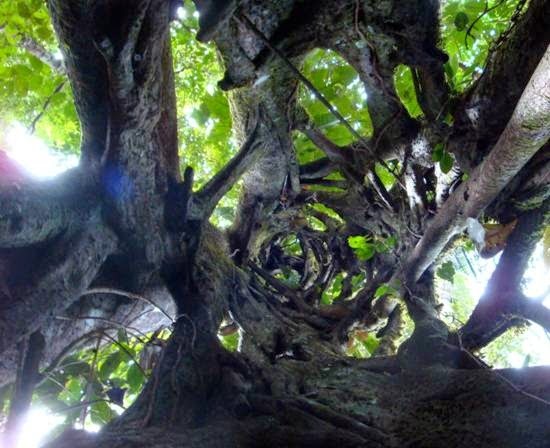 Image: The inside of Ficus auereus, “the strangler fig,” long after it’s host tree has perished. "The approach the strangler takes to success -- exploit the efforts of others, and value speed and aggression above everything else -- can, indeed, prove "competitive."" Only a mind conditioned by humanity’s modus operendi of exploitation of nature sees exploitation within nature. Mr. Pope ignores the infinite complexity and intelligence of the high-order ecosystems in which Ficus and its “hosts” are born, live, sacrifice and die. Yes, sacrifice. Until one listens to the stillness within one’s own heart, like Beethoven, Agnelli, and countless geniuses and masters of their craft did, one will not be inspired by nature to create works of Truth and beauty, worthy of posterity and the ages. While one only remains in the cold prison of the intellect, subjective and conditioned by “the big machine” that humanity built, one will only produce intellectual drivel aligned with the status quo…just more uninspired baying by another uncreative sheep. That said, the more one opens oneself to the ecosystem, to the deeper truth of nature: that mutual harmony and symbiosis are its modus operendi, the more one will have access to authentic inspiration, imagination, creative intuition, outside-the-box thinking, and all the faculties of awakening consciousness employed by all the great masters throughout history.